Prior to all flights, pilots should take the time and study the airport layout for all of the airports that they intend to land, including those that may be used as an alternate. During the flight planning phase, study the taxi procedures for the departure airport and landing procedures for the arrival airport. The expected taxi route should be checked against the airport diagram or taxi chart, and special attention should be given to the unique or complex intersections along the taxi route. Pilots should identify critical times and locations on the taxi route (e.g., transitioning through complex intersections, crossing intervening runways, entering and lining up on the runway for takeoff, and approaching and lining up on the runway for landing). By knowing the layout of the airport and their particular procedures, pilots are able to anticipate, understand, and safely execute all ATC directives and procedures. A major contributor to runway incursions is pilots not knowing the airport layout and procedures. This lack of situational awareness causes unnecessary accidents that can be avoided by proper flight planning. The FAA believes that following the aircraft’s progress on the airport diagram to be sure that the instructions received from ATC are being followed is one of the key procedures in reducing runway incursions. To do this, pilots must take the time prior to the flight to study all procedures so that they are not trying to learn about the airport while they are receiving ATC instructions. The airport sketch, located on the bottom of the chart, includes many helpful features. IAPs for some of the larger airports devote an entire page to an airport diagram. Airport sketch information concerning runway orientation, lighting, final approach bearings, airport beacon, and obstacles all serve to guide the pilot in the final phases of flight. See Figure 1-21 for a legend of airport diagram/airport sketch features (see also Figure 1-10 for an example of an airport diagram). The airport elevation is indicated in a separate box at the top left of the airport sketch. The touchdown zone elevation (TDZE), which is the highest elevation within the first 3,000 feet of the runway, is designated at the approach end of the procedure’s runway. Beneath the airport sketch is a time and speed table when applicable. The table provides the distance and the amount of time required to transit the distance from the FAF to the MAP for selected groundspeeds. The airport diagram shows the paved runway configuration in solid black, while the taxiways and aprons are shaded gray. Other runway environment features are shown, such as the runway identification, dimensions, magnetic heading, displaced threshold, arresting gear, usable length, and slope. Figure 1-24. 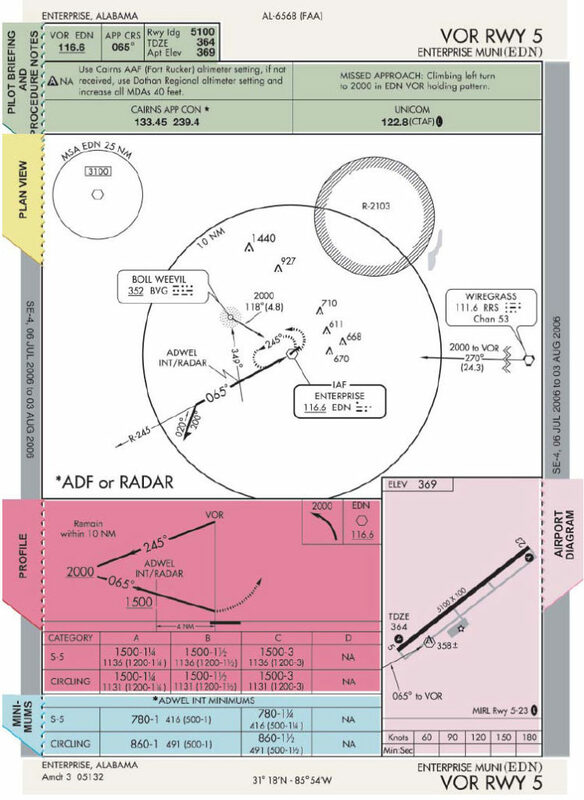 RNAV instrument approach charts. Figure 1-24. (cont.) 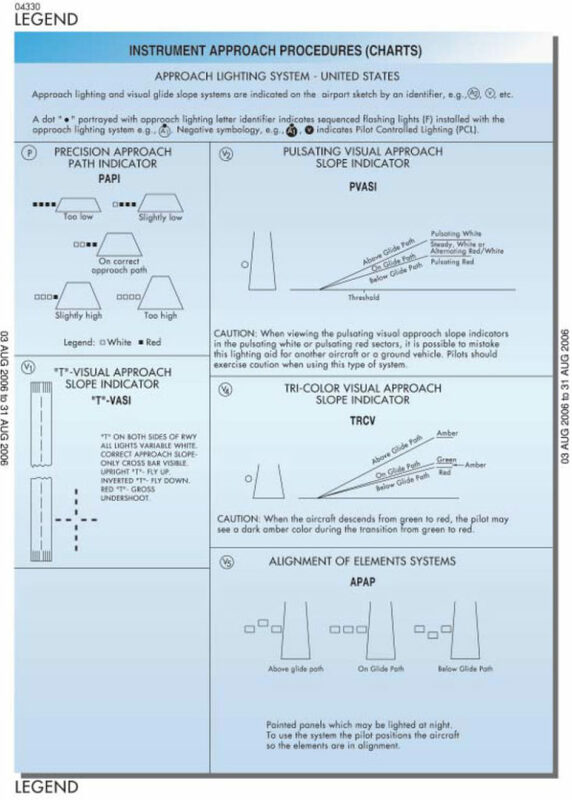 RNAV instrument approach charts. 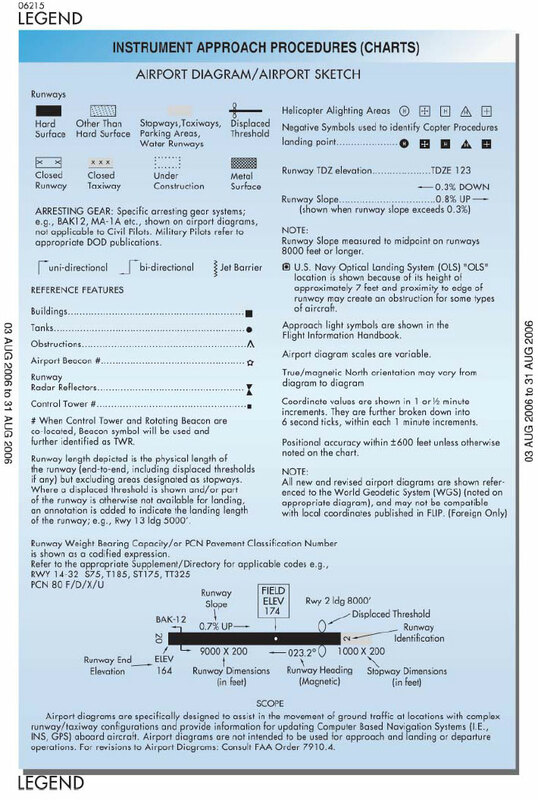 The chart may contain as many as four lines of approach minimums: global landing system (GLS), WAAS and LAAS, LNAV/VNAV, LNAV, and circling. LNAV/VNAV is an instrument approach with lateral and vertical guidance with integrity limits similar to barometric vertical navigation (BARO VNAV). RNAV procedures that incorporate a final approach stepdown fix may be published without vertical navigation on a separate chart also titled RNAV. 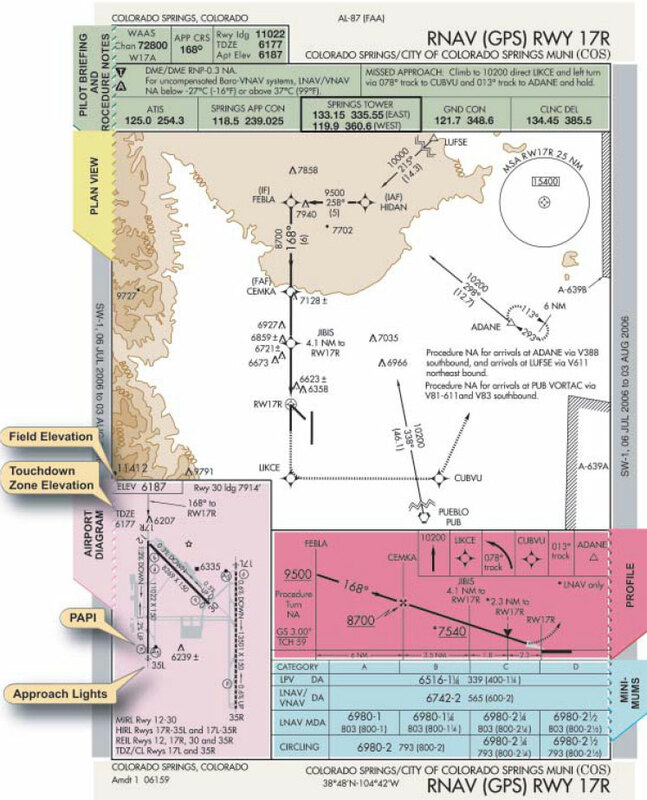 During a transition period when GPS procedures are undergoing revision to a new title, both RNAV and GPS approach charts and formats are published. ATC clearance for the RNAV procedure authorizes a properly certificated pilot to utilize any landing minimums for which the aircraft is certified. DA replaces the term DH. 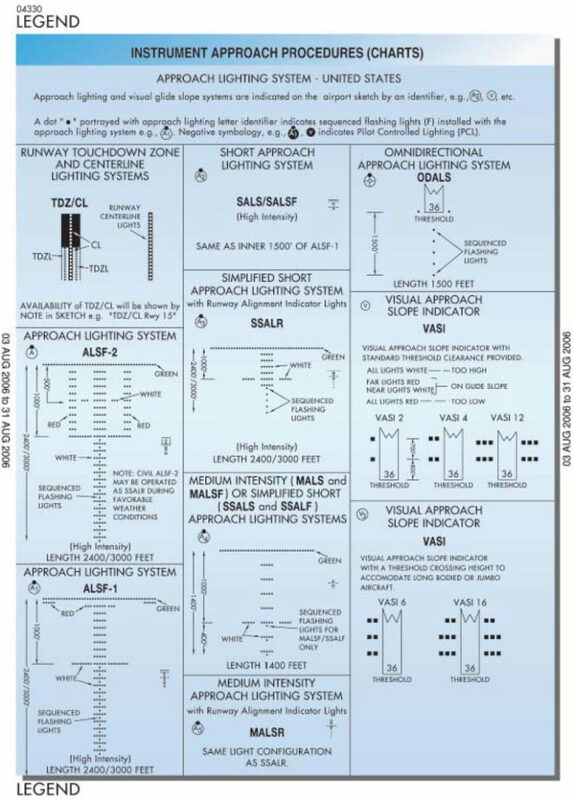 DA conforms to the international convention where altitudes relate to MSL and heights relate to AGL. DA will eventually be published for other types of IAPs with vertical guidance, as well. DA indicates to the pilot that the published descent profile is flown to the DA (MSL), where a missed approach is initiated if visual references for landing are not established. Obstacle clearance is provided to allow a momentary descent below DA while transitioning from the final approach to the missed approach. The aircraft is expected to follow the missed approach instructions while continuing along the published final approach course to at least the published runway threshold waypoint or MAP (if not at the threshold) before executing any turns. 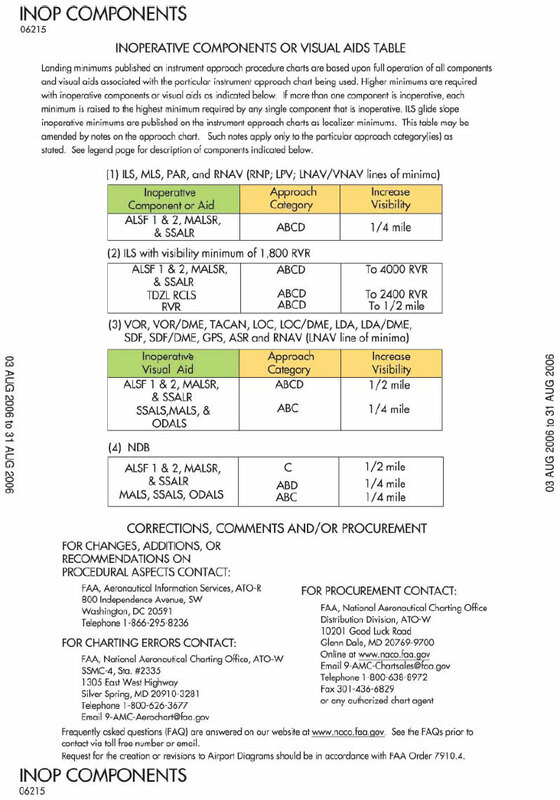 MDA continues to be used only for the LNAV and circling procedures. TCH has been traditionally used in precision approaches as the height of the GS above threshold. 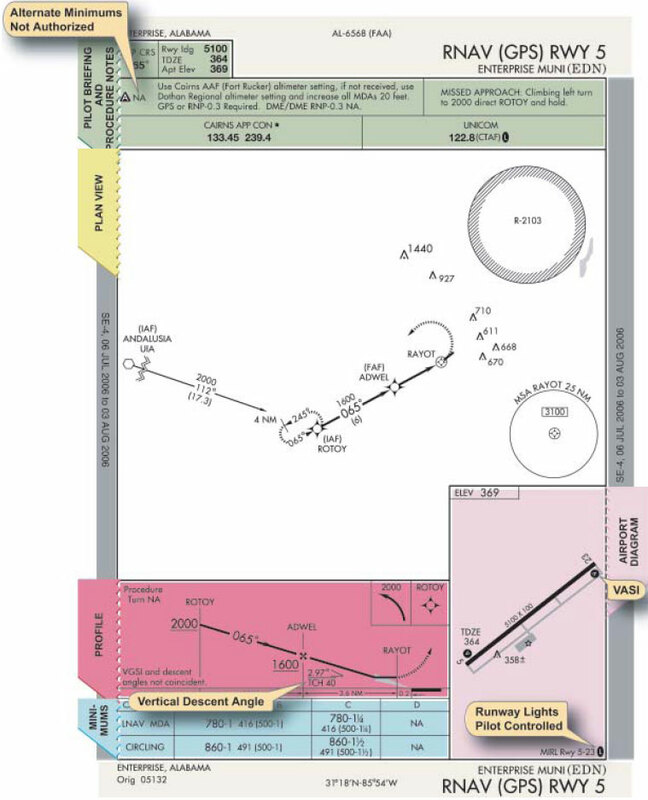 With publication of LNAV/VNAV minimums and RNAV descent angles, including graphically depicted descent profiles, TCH also applies to the height of the “descent angle,” or glidepath, at the threshold. Unless otherwise required for larger type aircraft that may be using the IAP, the typical TCH is 30 to 50 feet. 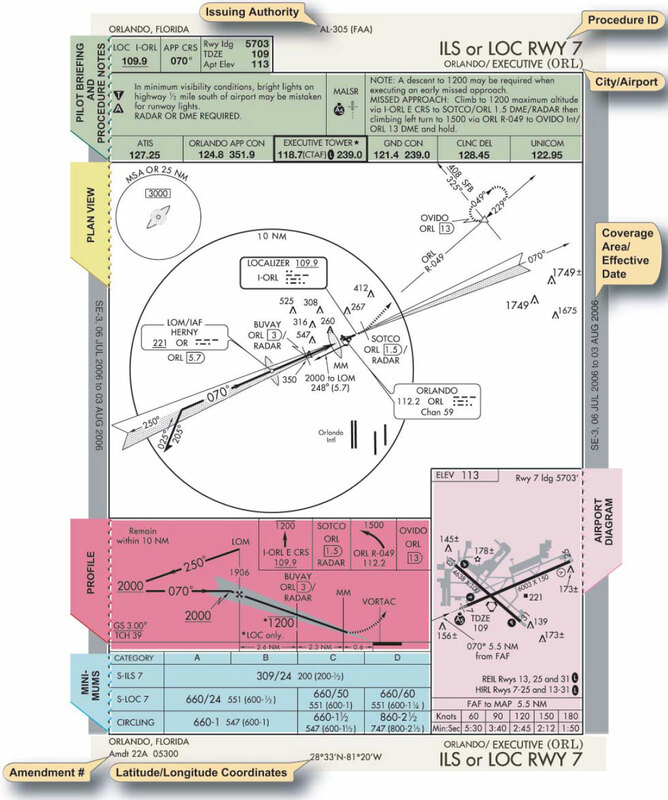 Each line of minima on the RNAV IAP is titled to reflect the RNAV system applicable (e.g., LPV, LNAV/ VNAV, and LNAV). Circling minima is also provided. The minima title box also indicates the nature of the minimum altitude for the IAP. For example: DA is published next to the minima line title for minimums supporting vertical guidance, and MDA is published where the minima line supports only lateral guidance. During an approach where an MDA is used, descent below MDA is not authorized. Where two or more systems share the same minima, each line of minima is displayed separately.